Photo courtesy of Kevin Chambers. The best the factory can make. Cosy, comfortable balls; just the way I like ’em! There is a good chance that these contain nuts. These gave me a cute indigestion. 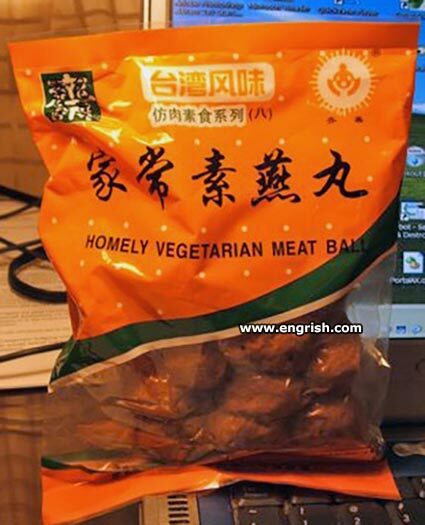 Why would you get meat balls from a homely vegetarian? Retreat and think of cakes. If yyour balls are too homely, no c–t will go near them. – What’s for dinner, darling? It must be vegetarian if it came from a plant. @Yu No Hoo. 0448. So! If I eat birds I find in trees, and other arboreal animals….They don’t count? Is consuming your lady permissible, on a vegan diet? Mmmm, crisp like a sock and stewed like a dork. Unless it is a carnivorous plant or man-eating tree. Based on the pic, those “balls” don’t look very round to me. @Pete 0611. In fact, they look bloody offal. Actually, I have eaten a vegetarian “steakburger”. The steak was made of nut-meal and soy-meal. Not to compare with a chunk of round or topside, though. I’ll bet they taste bloody offal too. @Algernon 0403 and Yoo No Hoo 0448. In truth. They are the very Fabrik of existance. Actually they are imitation meat made from soya &/or gluten and do resemble the texture of real meat. Hence the term “vegetarian meat ball” and of course that’s where the oxymoron creeps in.